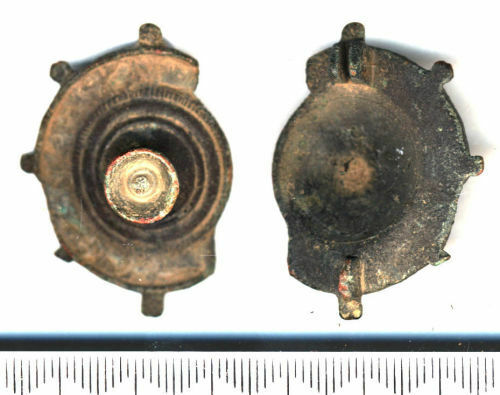 Copper-alloy conical disc brooch, missing pin and part of the outer ring of the main body. The pin was hinged on two close set lugs, both now blocked with corrosion, probably copper alloy from the pin bar. Opposite the lugs is an incomplete catchplate. 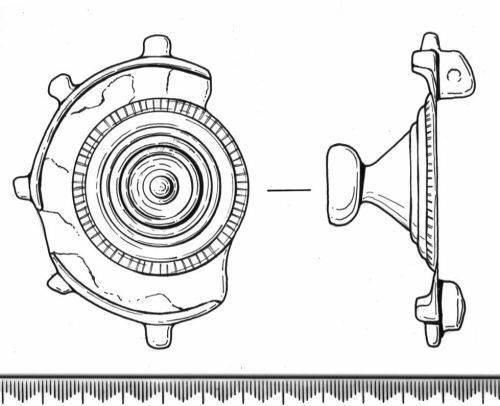 The central cone has a hollow hemispherical setting at the top, within which a small knob is lower than the sides. The cone has three concentric ribs at the base; the outer one has fine incised lines across it. A broad flat area beyond this has a 2 mm high turned-up flange around the edge, and within it patches of corroded material, probably solder. Five of an original eight small projecting lugs survive around the edge, one on the line of the pin bar lugs and one on the line of the catchplate. Diameter (excluding lugs) 33 mm, height of cone and base (excluding pin bar lugs) 12.5 mm. Type as Hattatt no. 1431; Hattatt suggests that it is mainly found in Britain and Gaul but occasionally scattered well beyond, and dates to the later 2nd and 3rd century.